Economic policy for artificial intelligence: Artificial intelligence (AI) technologies advanced rapidly over the past several years. Governments around the world responded by developing AI strategies. France released its national AI strategy in March 2018, emphasising research funds, ethical issues, and inequality. China stated a goal of being the top AI country by 2030. The EU, Canada, Japan, the Obama administration, the Trump administration, and many others have put forth their own plans (Sutton 2018). Pessimistic views of the impact of AI on society are widespread. Elon Musk, Stephen Hawking, Bill Gates, and others warn that rapid advances in AI could transform society for the worse. More optimistically, AI could enhance productivity so dramatically that people have plenty of income and little unpleasant work to do (Stevenson 2018). Regardless of whether one adopts a pessimistic or optimistic view, policy will shape how AI affects society. While the Oxford English Dictionary defines artificial intelligence as “the theory and development of computer systems able to perform tasks normally requiring human intelligence”, the recent excitement is driven by advances in machine learning, a field of computer science focused on prediction. As machine learning pioneer Geoffrey Hinton put it: “Take any old problem where you have to predict something and you have a lot of data, and deep learning is probably going to make it work better than existing techniques”.1 Recent advances in AI can therefore be seen as a drop in the cost of prediction. Because prediction is an important input into decision-making, in recent work we discuss how AI is likely to have widespread consequences as a general purpose technology (Agrawal et al. 2018a, 2018b). There are two aspects of AI policy. First, regulatory policy has an impact on the speed of diffusion of the technology and the form that the technology takes. Second, a number of policies focus on mitigating potential negative consequences of AI with respect to labour markets and antitrust concerns. Liability rules will also impact the diffusion of AI (Galasso and Luo 2018). Firms will be less likely to invest in the development of AI products in the absence of clear liability rules. Autonomous vehicles provide a useful example. A number of different companies will participate in the development of a self-driving car. If a car gets into an accident, would the sensor manufacturer be liable? The telecommunications provider? The vehicle manufacturer? Or perhaps an AI software firm? Without clear rules on who is liable, all may hesitate to invest. If autonomous vehicles would save lives, should manufacturers of non-autonomous vehicles be held to higher standards than current law requires? This would accelerate diffusion of the safer technology. In contrast, if the increases in liability focus is primarily on newer technology, then diffusion will slow. In addition, similar to other technologies, advances will be faster with more research support, well-balanced intellectual property law, and the ability to experiment in a safe way. A common worry about AI concerns the potential impact on jobs. If machines can do tasks normally requiring human intelligence, will there be jobs left for humans? In our view, this is the wrong question. There are plenty of horrible jobs. Furthermore, more leisure is generally considered to be a positive development, although some have raised concerns about the need to find alternate sources of meaning (Stevenson 2018). The most significant long-run policy issues relate to the potential changes to the distribution of the wealth generated by the widespread use of AI. In other words, AI may increase inequality. If AI is like other types of information technology, it is likely to be skill-biased. The people who benefit most from AI will be educated people who already are doing relatively well. These people are also more likely to own the machines. Policies to address the consequences of AI for inequality relate to the social safety net. While some have floated relatively radical ideas to deal with the potential increase in inequality – such as a tax on robots and a universal basic income – the AI context is not unique in weighing the costs and benefits of social programmes from progressive taxation to universal healthcare. In the shorter run, if AI diffuses widely, the transition could mean temporary displacement for many workers. Acemoglu and Restrepo (2018) emphasise a short- and medium-term mismatch between skills and technology. This means that policy preparation in advance of the diffusion of AI should consider both business cycles and education policy. Technology-driven layoffs concentrated in location and time are not unique to AI. They were a feature of factory automation and the mechanization of farming. For education policy, there are many open questions. Should we emphasise social skills and the humanities if machines increasingly are able to do technology-related prediction tasks? Should the education system evolve to focus more on adults? How do the skills needed as AI diffuses differ from the skills currently provided through the education system? Another policy question around the diffusion of AI relates to whether it will lead to monopolisation of industry. The leading companies in AI are large in terms of revenue, profits, and especially market capitalisation (high multiples on earnings). This has led to an increase in antitrust scrutiny of the leading technology firms from governments (particularly the European Commission) and in the press (see, for example, The Economist’s 20 January 2018 cover story, “The new titans, and how to tame them”, and their subsequent story, “The market for driverless cars will head towards monopoly”, on 7 June 2018). Much of this antitrust scrutiny focuses on the role of these firms as platforms, not on their use of AI per se. The feature that makes AI different is the importance of data. Firms with more data can build better AI. Whether this leads to economies of scale and the potential for monopolisation depends on whether a small lead early in the development cycle creates a positive feedback loop and a long-run advantage. Much of economic policy for AI is simply economic policy. For the diffusion of AI, it resembles innovation policy. For the consequences of AI, it resembles public policy (the social safety net) and competition policy (antitrust). We summarise aspects of economic policy for AI in Table 1. Although AI is like other technologies in many respects, it is unusual in a few important dimensions. Specifically, AI is both a general purpose technology (GPT) – i.e. it has a wide domain of applications – as well as an ‘invention of a method of invention’ (IMI) (Cockburn et al., 2018; Agrawal et al. 2018). Cockburn et al. assert that “… the arrival of a general purpose IMI is a sufficiently uncommon occurrence that its impact could be profound for economic growth and its broader impact on society.” They assemble and analyse the corpus of scientific papers and patenting activity in AI, and provide evidence consistent with the characterisation of machine learning as both a GPT and IMI. The implication concerns the returns to investments in AI policy design. Due to the breadth of applications, the cost of suboptimal policy design will likely be significantly higher than with other technologies – or the benefits of optimal policy greater. Furthermore, the returns to investments in policy design are not only a function of the directeffects, where AI “directly influences both the production and the characteristics of a wide range of products and services”, but also the indirecteffects because “AI also has the potential to change the innovation process itself, with consequences that may be equally profound, and which may, over time, come to dominate the direct effect” (Cockburn et al. 2018). Authors’ note: The points we raise in this column are based on Agrawal et al. (2018a), which in turn builds on discussions at the 2017 NBER Conference on the Economics of AI in Toronto and the associated conference volume (Agrawal et al. 2018c). Acemoglu, D, and P Restrepo (2018), “Artificial Intelligence, Automation and Work”, in A Agrawal, J Gans, and A Goldfarb (eds), The Economics of Artificial Intelligence: An Agenda, University of Chicago Press. Agrawal, A, J Gans, and A Goldfarb (2018a), “Economic Policy for Artificial Intelligence”, NBER Working Paper 24690. Agrawal, A, J Gans, and A Goldfarb (2018b), Prediction Machines: The Simple Economics of Artificial Intelligence, Harvard Business School Press. Agrawal, A, J Gans, and A Goldfarb (eds) (2018c), The Economics of Artificial Intelligence: An Agenda, University of Chicago Press. Agrawal, A, J McHale, and A Oettl (2018), “Finding Needles in Haystacks: Artificial Intelligence and Recombinant Growth”, in A Agrawal, J Gans, and A Goldfarb (eds), The Economics of Artificial Intelligence: An Agenda, University of Chicago Press. Cockburn, I, R Henderson, and S Stern (2018), “The Impact of Artificial Intelligence on Innovation”, in A Agrawal, J Gans, and A Goldfarb (eds), The Economics of Artificial Intelligence: An Agenda, University of Chicago Press. Galasso, A, and H Luo (2018), “Punishing Robots: Issues in the Economics of Tort Liability and Innovation in Artificial Intelligence”, in A Agrawal, J Gans, and A Goldfarb (eds), The Economics of Artificial Intelligence: An Agenda, University of Chicago Press. Goldfarb, A, and C Tucker (2012), “Privacy and Innovation”, in J Lerner and S Stern (eds), Innovation Policy and the Economy, Volume 12, NBER, University of Chicago Press: 65-89. Sutton, T (2018), “An Overview of AI Strategies”, Medium, 28 June. Stevenson, B (2018), “AI, Income, Employment, and Meaning”, in A Agrawal, J Gans, and A Goldfarb (eds), The Economics of Artificial Intelligence: An Agenda, University of Chicago Press. https://www.youtube.com/watch?v=2HMPRXstSvQ (accessed 22 May 2018). The Future of Work: Automation and Labor: Inclusive AI: Technology and Policy for a Diverse Human Future: Thank you very much. Let me follow the example of our Lord and Master Alpha-Go as it takes the high ground first. Let me, therefore, take the hyper-Olympian and very long run historical point of view. The human brain is a massively parallel supercomputer that fits inside half a shoebox. It draws 50 watts of power. It is an amazing innovation, analysis, assessment and creation machine. 600 million years of proto-mammalian and mammalian evolution coupled with the genetic algorithm means that almost every single human can solve AI problems far beyond our current engineering reach—so much so that much of what our machines find impossible our brains find so trivially easy that we call such capabilities "unskilled". When combined with our brains, human fingers are amazingly fine manipulation devices. Human back and leg muscles—especially when testosterone soaked—are quite good at moving heavy objects. Thus back in the environment of evolutionary adaptation, we used our brains, our big muscles, and our fingers to lead cognitively interesting if stressful and short lives. Competition from China Reduced Domestic Innovation: While much attention has been paid to the impact of Chinese imports on U.S. factory employment, relatively little has been focused on other affected areas, such as innovation by American manufacturers. In Foreign Competition and Domestic Innovation: Evidence from U.S. Patents (NBER Working Paper No. 22879), David Autor, David Dorn, Gordon H. Hanson, Gary Pisano, and Pian Shu compare firm-level data on patents obtained in the period 1975 to 1991—before the surge in Chinese imports—with data for the period 1991 to 2007. They find that while patent output and exposure to trade were not significantly correlated in the earlier period, they were in the latter. China's exports made up nearly 19 percent of the world's total in 2013, up from just 2.3 percent in 1991. The study finds that corporations in U.S. industries where the Chinese made their greatest inroads experienced the most pronounced decline in innovation. The researchers use patents as their main proxy for innovation, but the study's conclusions are corroborated by corresponding trends in research and development spending. Corporations tightened their belts across the board as imports eroded revenues. There was no association between rising imports and patents generated among entities relatively immune to international market forces, such as universities, hospitals, and nonprofit research institutions. In conducting their study, the researchers controlled for other factors that could influence the rate of patent generation, such as the post-2001 dot-com bust, a trend toward greater scrutiny of patent applications, and pre-existing trends in the rate of patenting in key industries. The study's long-term perspective, using data from 1975 to 2007, reveals a growth trend in patenting in the computer and electronics industries and a trend of stagnation of patenting in chemicals and pharmaceuticals, which are two of the most important sectors for innovation. Both of these trends predate the surge in Chinese import competition of the 1990s and 2000s, which was much stronger in the computer and electronics industries than in industries that create new chemical patents. Given the countervailing trends in these two large, patent-intensive sectors, simple correlations would suggest — misleadingly, it turns out—that industries with larger increases in trade exposure during the sample period of 1991 to 2007 did not exhibit significant falls in patenting. Once the researchers account for preexisting trends in just these two sectors—computers and chemicals—the adverse impact of trade exposure on industry patenting becomes strongly apparent and can be precisely estimated. While manufacturing employs less than a tenth of U.S. private nonfarm workers, it accounts for two-thirds of the country's research and development spending and corporate patents. "The relationship between competition in the global marketplace and the creation of new products and production processes is thus one of immense importance for the U.S. economy," they write. The researchers ask why corporations do not spend more on innovation in the face of mounting Chinese imports. One possibility is that firms assume increased competition will lead to a permanent decline in the profitability of their market sectors, giving them little incentive to invest. Another is that American consumers, accustomed to low-cost Chinese goods, have become less inclined to pay more for innovative alternatives. A third possibility is that as American companies shifted their factories to lower-cost countries while keeping R&D at home, the geographic separation impeded the coordination that helps fertilize innovation. "Each explanation has important implications for both policy and our understanding of the impact of trade on economic performance," the researchers conclude. Manufacturing's Productivity Myth: The U.S. manufacturing sector is far from the basket case it is sometimes made out to be on the campaign trail. But it's important to realize that it isn't exactly going gangbusters, either. There's a catch, though. As economist Susan N. Houseman of the W.E. Upjohn Institute for Employment Research ... points out, about half of the growth in U.S. manufacturing output since 1997 has been in just one sector: computer and electronics manufacturing. Such quality adjustment ... can make the numbers difficult to interpret..., figures that exclude this industry ... arguably provide a clearer picture of trends in manufacturing output. As it stands now, those trends don't look impressive. U.S. manufacturing output has held up a lot better than manufacturing employment. But it definitely isn't booming. Why Are Politicians So Obsessed With Manufacturing? : ...Trump has made the revival of American manufacturing a signature issue... Hillary Clinton has campaigned on a broader economic agenda, but when it came time to describe those plans, she chose a fac­tory outside Detroit as her backdrop. Manufacturing retains its powerful hold on the American imagination for good reason. In the years after World War II, factory work created a broadly shared prosperity that helped make the American middle class. People without college degrees could buy a home, raise a family, buy a station wagon, take some nice vacations. It makes perfect sense that voters would want to return to those times. The Facts of Economic Growth: ... One of the most obvious and readily quantified measures of government involvement in the economy is taxes. It is easy to write down models in which governments that tax heavily reduce the long-run success of their economies. The facts, however, are not so clear. Figure 33 shows the growth rate of real GDP per person in the United States since 1980 as well as the total government tax revenues (including state and local) as a share of GDP... The stunning fact that emerges from this graph is that taxes have increased enormously, from around 10 percent of GDP in 1929 to more than 30 percent of GDP at their peak in 2000. But as we already noted earlier, growth rates over the 20th century were remarkably stable — if anything, they were higher after 1950 than before. Figure 34 shows a related fact by looking across the countries of the world: tax revenues as a share of GDP are positively correlated with economic success, not negatively correlated. Intelligent Technology: A computer now sits in the middle of virtually every economic transaction in the developed world. Computing technology is rapidly penetrating the developing world as well, driven by the rapid spread of mobile phones. Soon the entire planet will be connected, and most economic transactions worldwide will be computer mediated. Chad Syverson reckons that the unrecorded value of the digital economy to the average citizen would need to be $8400 per year in order to explain the entire productivity gap. This is one fifth of net disposable income per person. He suggests, on prima facie grounds, that few people would value their access to the digital economy at one fifth of their disposable income. If that conjecture (and it is no more than a conjecture) is valid, there might be something in the mismeasurement hypothesis after all. 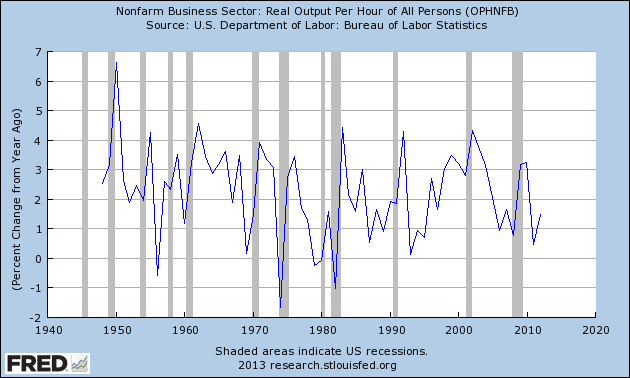 But the evidence suggests that it is not the main reason for the productivity debacle . Beating a Dead Robotic Horse: One of the recurring themes on this blog has been the consequences of robots, AI, or rapid technological change on labor demand. Will humans be put out of work by robots, and will this mean paradise or destitution? I’ve generally argued that we should be optimistic about robots and AI and the like, but others have made coherent arguments for pessimism. I spent a chunk of this week reading over posts, both new and old, and thinking more about these positions. If there is one distinct difference between the robo-pessimist and robo-optimist view, it is almost exclusively down to timing. The pessimists are worried that the rapid decline of human labor is occurring now, and in many cases has been occurring for a while already. The optimists believe that we have time in front of us to sort things out before human labor is replaced en masse. I tend to be a weak robo-optimist. I, like Brynjolfsson and McAfee, completely agree that robots/AI will create a drag on the demand for human labor, and in particular unskilled labor. My robo-optimism isn’t a belief about technology. It is a belief that we can figure out how to manage the glide path towards shorter work hours while maintaining living standards for everyone. It’s a good thing that we’ll have to work less. And there remains a little piece of strong robo-optimism lurking inside of me. I don’t think work less is really well defined. We will likely have to spend less time working for wages to afford the basic material goods in our lives. But that doesn’t mean we won’t spend lots of our time “working” for each other doing other things. Whether that work is paid in wages or not is immaterial. How Socioeconomic Status Impacts Online Learning: The driving force behind the increasing popularity of massive open online courses (MOOCs) is that they provide — as the term defines it — open access to a massive online audience. Anyone with an Internet connection who wants to learn, can. Whether you’re rich or poor, living in a New York City high-rise or a remote Nepalese village, MOOCs promise to level the higher education playing field. The question is: Does reality reflect this ideal? A new research study by MIT education researcher Justin Reich and Harvard University’s John Hansen seeks the answer. “Democratizing Education? Examining Access and Usage Patterns in Massive Open Online Courses” takes a close look at how socioeconomic resources influence MOOC enrollment and course completion — and whether online learning is truly opening as many doors as anticipated. Reich’s study uses three indicators: parental educational attainment, neighborhood average educational attainment, and neighborhood median income. The research finds that these indicators are correlated with student enrollment and success in MOOCs, especially among younger students. Young students enrolling in HarvardX and MITx on edX live in neighborhoods where the median income is 38 percent higher than typical American neighborhoods. Among teenagers who register for a HarvardX course, those with a college-educated parent have nearly twice the odds of finishing the course compared to students whose parents did not complete college. At exactly the ages where online learning could offer a new pathway into higher education, already affluent students are more likely to enroll in a course and succeed. The takeaway is that MOOCs have not yet solved SES-related disparities in educational outcomes, and Reich believes it’s critical to turn these learnings into actions in order to narrow the gaps between MOOC perception and reality. I have a lot of sympathy for this view. ... The very language we use to speak of business cycles, of trend growth rates, of recoveries of to those perhaps non-stationary trends, and so on—which reflects the underlying mental framework of most macroeconomists—would have to be rethought. Productivity-based growth requires disruption in economic thinking just as it does in the real world. The full text explains these points in more detail (I left out one point on the measurement of productivity). Calibrating the Hype about Online Higher Education: "Massive open online courses" (MOOCs) and other aspects of online higher education were white-hot a few years ago, but I'd say that they have cooled off to only red-hot. Two economists who have also been college presidents, Michael S. McPherson and Lawrence S. Bacow discuss the current state of play and offer some insights in "Online Higher Education: Beyond the Hype Cycle," appearing in the Fall 2015 issue of the Journal of Economic Perspectives. Here are some points that caught my eye. About one-quarter of higher education students took an online course in 2013, and about one-ninth of higher education students took all of their courses online that year. "The US Department of Education recently began to conduct its own survey of online education as part of its Integrated Post-Secondary Education Data System (IPEDS), with full coverage of the roughly 4,900 US institutions of higher education. As shown in Table 1, IPEDS data indicates that as of 2013, about 26 percent of all students took at least one course that was entirely online, and about 11 percent received all of their education online." When it comes to the possibility of education technologies that can operate at large scale with near-zero marginal costs, there's a history of overoptimism. Here's a quick sketch of promises about educational radio, and then educational television. "Berland (1992), citing a popular commentator named Waldeman Kaempffert writing in 1924, reported that “there were visions of radio producing ‘a super radio orchestra’ and ‘a super radio university’ wherein ‘every home has the potentiality of becoming an extension of Carnegie Hall or Harvard University.’” Craig (2000) reports that “the enthusiasm for radio education during the early days of broadcasting was palpable. Many universities set up broadcast stations as part of their extension programs and in order to provide their engineering and journalism students with experience in radio. By 1925 there were 128 educational stations across the country, mostly run by tertiary institutions” (p. 2831). The enthusiasm didn’t last—by 1931 the number of educational stations was down to 49, most low-powered (p. 2839). This was in part the result of cumbersome regulation, perhaps induced by commercial interests; but the student self-control problem ... likely played a role as well. As NBC representative Janice Waller observed, “Even those listeners who clamored for educational programs, Waller found, secretly preferred to listen to comedians such as Jack Benny. These “intellectually dishonest” people “want to appear very highbrow before for their friends . . . but down inside, and within the confines of their own homes, they are, frankly, bored if forced to listen to the majority of educational programs” (as quoted in Craig 2000, pp. 2865–66). "The excitement in the late 1950s about educational television outshone even the earlier enthusiasm for radio. An article by Schwarzwalder (1959, pp. 181–182) has an eerily familiar ring: “Educational Television can extend teaching to thousands, hundreds of thousands and, potentially, even millions. . . . As Professor Siepman wrote some weeks ago in The New York Times, ‘with impressive regularity the results come in. Those taught by television seem to do at least as well as those taught in the conventional way.’ . . . The implications of these facts to a beleaguered democracy desperately in need of more education for more of its people are immense. We shall ignore these implications at our national peril.” Schwartzman goes on to claim that any subject, including physics, manual skills, and the arts can be taught by television, and even cites experiments that show “that the discussion technique can be adapted to television.”"
The Internet offers the possibility not just of widespread distribution of education material, but also of interactive content. But if the content is to be richly interactive--that is, more than just a short multiple-choice quiz inserted into the recorded material--the costs of design and production could be very substantial. "Richly interactive online instruction is obviously much more expensive than Internet-delivered television. The development costs for Carnegie Mellon’s sophisticated but far from fully computer-adaptive courses in statistics and other fields have been estimated at about $1 million each (Parry 2009). Although future technical developments will reduce the costs of providing a course of a fixed level of quality over time, those future technical developments will also encourage the provision of additional features. Universities can invest in improving the production values of such television programs at the margin in ways that range from multiple camera angles to the incorporation of sophisticated graphics and live location video. Many interactive courses could also conceivably benefit from regular updating based on recent events or scholarship ... Our point is that while online courses offer the potential for constant modification and updates, realizing this potential may in fact be expensive, leading to less-frequent updates than for traditionally taught subjects. ... Those who foresee the widespread adoption of adaptive learning technology often underestimate the cost of producing it. Stanford President John Hennessey, in a recent lecture to the American Council of Education, estimated that the cost of producing a first-rate highly interactive digital course to be in the millions of dollars (Jaschik 2015). Few individual institutions have the resources to make such investments. Furthermore, while demand may be substantial enough to support such investments for basic introductory courses in fields that easily lend themselves to such instruction, it is unlikely that anyone will invest in the creation of such courses for upper-level courses unless they can be adopted at scale. There's no guarantee that online tools will reduce the costs of higher education. One possibility is that well-endowed universities use online higher education as a way to drive up costs--since these schools often compete to provide a high-end experience. For example, expensive schools might "flip the classroom" by paying for both a rich and interactive online course, and then also hiring enough faculty members (not graduate students!) to staff a large number of discussion and problem-solving sections. Indeed, there is a real chance that at least in selective higher education, technology will actually be used to raise rather than lower cost. There are obvious ways to use online materials to complement rather than to substitute for in-person instruction. Flipping the classroom, as we will explain further, is one. Instructors can also import highly produced video material—either purchased or homemade— to complement their classes, and there could easily emerge a market in modular lessons aimed at allowing students to extend material farther or to get a second take on a difficult set of concepts. If individual faculty members are authorized to make these choices, and universities agree to subsidize expensive choices, costs seem likely to rise. Conversely, schools that are lower-ranked and with fewer financial resources may be pushed to focus on implementing a low-cost and mostly online curriculum. Broad-access unselective institutions are already among the largest users of online instruction. These institutions are responsible for the education of many students—at least half of all those enrolled in postsecondary education—and they disproportionately educate lower-income students and students of color. Enabling technological advances to support improvement in the educational success of these institutions at manageable cost is an important goal, arguably the most important goal for using technology to improve American higher education. (Of course, the implications of these technologies for global learning would be potentially gigantic.) There is especially high potential for online education to cater to the large number of nontraditional students, which includes adult learners and those who have a very high opportunity cost of attending college whether at the undergraduate or graduate level. For this group of students, asynchronous online learning can be a godsend. Opportunities surely exist for technology to penetrate this market further, and quality is likely to improve as faculty and others figure out how to take better advantage of new educational technology. As the technology improves and as more institutions adopt it, more of these students are likely to receive all or at least some of their education online. Yet this great opportunity is accompanied by considerable risk. It is all too easy to envision legislators who see a chance to cut state-level or national-level spending that supports higher education by imposing cheap and ineffective online instruction on institutions whose students lack the voice and political influence to demand quality. It’s equally easy to imagine for-profit institutions proffering online courses in a way that takes advantage of populations with little experience with college in a marketplace where reliable information is scarce. The gist of the report concludes that the economic problems facing the American middle class have less to do with unfairness—or the idea that the system is fundamentally “rigged” against workers—and more to do with technological and globalization forces that can’t be reversed. He says that leading economic ideas on the left, including advocacy for a $15 minimum wage, expanded Social Security benefits and a single-payer health-care system, won’t play well with independent voters. The report cites focus group research in advancing its argument that Americans, particularly independents and moderate voters, are more anxious than they are angry about these changes. Third Way cites the failures of main street icons such as Kodak, Borders Books and Tower Records as proof that new technologies and delivery systems, as opposed to a “stacked deck” in Washington, are primarily responsible for economic upheaval. Many economists contend that technology is the primary driver of the increase in wage inequality since the late 1970s, as technology-induced job skill requirements have outpaced the growing education levels of the workforce. The influential “skill-biased technological change” (SBTC) explanation claims that technology raises demand for educated workers, thus allowing them to command higher wages—which in turn increases wage inequality. A more recent SBTC explanation focuses on computerization’s role in increasing employment in both higher-wage and lower-wage occupations, resulting in “job polarization.” This paper contends that current SBTC models—such as the education-focused “canonical model” and the more recent “tasks framework” or “job polarization” approach mentioned above—do not adequately account for key wage patterns (namely, rising wage inequality) over the last three decades. So, should I adopt a message I don't think is true because it sells with independents who have been swayed by Very Serious People, or should I say what I believe and try to convince people they are barking up the wrong tree? (For the most part anyway, I believe both the technological/globalization and institutional/unfairness explanations have validity -- but how do workers capture the gains Third Way wants to create through growth and wealth creation without the bargaining power they have lost over time with the decline in unionization, threats of offshoring, etc.? That's the bigger problem.) It is unfair when, say, economic or political power redirects income away from those who created it to those who did not (I am using the normative equity principle that each person has a right to keep what he or she produces, to reap what they have sowed, and I have little doubt that workers have been paid less than their productivity, and those at the top more. That's unfair, and redirecting income -- redistributing if you will -- to those who actually earned it is not harmful. It is just, and it creates the correct economic incentives). Wealth creation/growth has not been the biggest problem over the last four decades (i.e. since inequality started to increase), it is how the gains have been distributed. I'd rather convince people of the truth that more growth and more wealth creation won't solve the problem if we don't address workers' bargaining power at the same time than gain their support by patronizing their views. In the meantime redistributing income from those who didn't earn it to those who did can serve as a temporary solution until we get the more fundamental underlying problems fixed (e.g. level the playing field on bargaining power between workers and firms). Maybe politicians have to tell people what they want to hear, I'll let them figure that out, but I will continue to call it as I see it even if "independents and moderate voters are more anxious than they are angry about these changes." That won't change if we play into those anxieties instead of explaining why new approaches are needed, and explaining how they will benefit from a system that does a better job of rewarding hard work instead of ownership, connections, and power. The Romer Model turns 25: 25 years ago this month Paul Romer‘s paper, “Endogenous Technological Change” was published in the Journal of Political Economy. After over 20,000 citations, it is one of the most influential economics papers of that period. The short version of what that paper did was to provide a fully specified model whereby technological change (i.e., the growth of productivity) was driven not be outside (or exogenous) forces but, instead, by the allocation of resources to knowledge creation and with a complete description of the incentives involved that provided for that allocation. Other papers had attempted this in the past — as outlined in David Warsh’s great book of 2006 — and others provided alternatives at the same time (including Aghion, Howitt, Grossman, Helpman, Acemoglu and Weitzman) but Romer’s model became the primary engine that fueled a decade-long re-examination of long-term growth in economics; a re-examination that I was involved in back in my student days. In summary, the Romer model was a milestone and led to much progress. It is a stunningly beautiful work of economic theory. But there is more to be done and my hope is we will see that happen in the future as the cumulative process that drives new knowledge can drive new economic knowledge as well. Technological Progress Anxiety: Thinking About “Peak Horse” and the Possibility of “Peak Human”, by by Brad DeLong: Another well-written piece by an authorial team led by the very sharp Joel Mokyr–The History of Technological Anxiety and the Future of Economic Growth: Is This Time Different?–that in my mind fails to wrestle with the major question, and so leaves me unsatisfied. Hitherto,... every form of non-human power that substitutes and thus tends to reduce the value of human backs and thighs...–from the horse to the watermill to the steam engine to the diesel to the jet engine–and every single source of manipulation–from the potter’s wheel to the loom to the spinning jenny to the assembly line to the mechanized factory–has required a cybernetic control mechanism. Without such a mechanism, machines are useless. They cannot keep themselves on course and on track. ... And as cybernetic control mechanisms human brains had an overwhelming productivity edge. I must say that I really do wish that Mokyr et al. had included, in their paper, a discussion of “peak horse”. A standard economists’ argument goes roughly like this: Technology is introduced only when it is profitable, and lowers the costs of production. Thus the prices of the goods and services produced must go down, leaving consumers with more money to spend on other products, and this creates demand for any workers who are displaced. Thus there will always be new industries growing up to employ any workers displaced by technological change in existing industries. Yet ... “Peak horse” in the U.S. came in the 1910s, I believe. After that there was no economic incentive to keep the horse population of America from declining sharply, as at the margin the horse was not worth its feed and care. And in a marginal-cost pricing world, in which humans are no longer the only plausible source of Turing-level cybernetic control mechanisms, what will happen to those who do not own property should the same come to be true, at the margin, of the human? What would “peak human” look like? Or–a related but somewhat different possibility–even “peak male”? The jobs that AI can't replace,BBC News: Current advances in robots and other digital technologies are stirring up anxiety among workers and in the media. There is a great deal of fear, for example, that robots will not only destroy existing jobs, but also be better at most or all of the tasks required in the future. Is the Pace at Which Labor-Saving Technology is Entering the Workforce Accelerating? There are various pieces of evidence suggesting that the answer is “no.” Most importantly, if the rate at which machines are replacing workers is increasing, then productivity growth—output/hours worked—should also be increasing. But it has been slowing. So, what we have is largely anecdote and our own observation..., but ... when it comes to observations, humans are good at seeing first derivatives (rates of change) and less good at seeing second derivatives (changes in rates of change). We see that iPads and self-scanners are replacing waitpersons and cashiers but it’s hard for us to tell whether “labor-saving technology” ...is coming more quickly than it has in the past. Of course, this time might really be different (some smart people say it is). Now, where have I seen that before? Fifty years ago (! ), I used to love to go to Manhattan automats, where ... a few coins would get you a sandwich, a veggie (not quinoa! ), a slice of delicious pie, and so on. For the record, productivity growth was faster and unemployment was lower back then (though at 10, I don’t recall knowing these facts at the time). All’s I’m saying is that tech change is always with us, and it’s really hard to tell by observation whether the pace with which it’s replacing workers is accelerating. And there are so many more moving parts to this. I’d bet a big difference between the economies in these two pictures is where the machines were manufactured. In other words, technology doesn’t historically kill labor demand. But it does move it around to different industries, occupations, and today, countries. For example, one concern from the time of the original Industrial Revolution was that factory work required scheduling their time in ways that removed flexibility. Mokyr, Vickers, and Ziebarth (citations omitted) note: "Workers who were “considerably dissatisfied, because they could not go in and out as they pleased” had to be habituated into the factory system, by means of fines, locked gates, and other penalties. The preindustrial domestic system, by contrast, allowed a much greater degree of flexibility." Now, of course, there is widespread concern about a lack of factory jobs for low- and middle-skilled workers. Rather than worrying about these jobs being debasing or unfit for humans, we worry that there aren't enough of them. I guess one reaction to this evolution of attitudes about "good jobs" is just to point out that workers and employers are both heterogenous groups. Some workers put a greater emphasis on flexibility of hours, while others might prefer regularity. Some workers prefer a straightforward job that they can leave behind at the end of the day; others prefer a job that is full of improvisation, learning on the fly, crises, and deadlines. To some extent, the labor market lets employers and workers match up as they desire. There's certainly no reason to assume that a "good job" should be a one-size-fits-all definition. A second reaction is that there is clearly a kind of rosy-eyed nostalgia at work about the qualities of jobs of the past. Many of us tend to focus on a relatively small number of past jobs, not the jobs that most people did most of the time. In addition, we focus on a few characteristics of those jobs, not the way the jobs were actually experienced by workers of that time. But yet another reaction is that the qualities of available jobs aren't just a matter of negotiation between workers and employers, and they aren't an historical inevitability. The qualities of the range of jobs in an economy are afffected by a range of institutions and factors like the human capital that workers bring to jobs, the extent of on-the-job training, how easy it is for someone with a series or employers or irregular hours to set up health insurance or a retirement account, rules about workplace safety, rules that impose costs on laying off or firing workers (which inevitably makes firms reluctant to hire more regular employees), the extent and type of union representation, rules about wages and overtime, and much more. I do worry that career-type jobs offering the possibility of longer-term connectedness between a worker and an employer seem harder to come by. In a career-type job, both the worker and employer place some value on the expected continuance of their relationship over time, and act and invest resources accordingly. Mrs. Clinton’s speech reflected major changes, deeply grounded in evidence, in our understanding of what determines wages. And a key implication of that new understanding is that public policy can do a lot to help workers without bringing down the wrath of the invisible hand. The ... market for labor isn’t like the market for, say, wheat, because workers are people. And because they’re people, there are important benefits, even to the employer, from paying them more: better morale, lower turnover, increased productivity. These benefits largely offset the direct effect of higher labor costs, so that raising the minimum wage needn’t cost jobs after all. The Good and Bad Parts of Online Education: Is online education the solution to widening inequality, rapidly rising costs, and lack of access to high quality courses? Will it lead to the demise of traditional “brick and mortar” institutions? I was initially very skeptical about the claims being made about online education, but after teaching several of these course during the past academic year my own assessment has become much more positive. The Big Meh, by Paul Krugman, Commentary, NY Times: ...Everyone knows that we live in an era of incredibly rapid technological change, which is changing everything. But what if what everyone knows is wrong? .... A growing number of economists ... are wondering if the technological revolution has been greatly overhyped... New technologies have yielded great headlines, but modest economic results. Why? One possibility is that the numbers are missing the reality, especially the benefits of new products and services. I get a lot of pleasure from technology that lets me watch streamed performances by my favorite musicians, but that doesn’t get counted in G.D.P. Still, new technology is supposed to serve businesses as well as consumers, and should be boosting the production of traditional as well as new goods. The big productivity gains of ... 1995 to 2005 came largely in things like inventory control, and showed up as much or more in nontechnology businesses like retail as in high-technology industries themselves. Nothing like that is happening now. So what do I think is going on...? The answer is that I don’t know — but neither does anyone else. Maybe my friends at Google are right, and Big Data will soon transform everything. Maybe 3-D printing will bring the information revolution into the material world. Or maybe we’re on track for another big meh. You see, writing and talking breathlessly about how technology changes everything might seem harmless, but, in practice, it acts as a distraction from more mundane issues — and an excuse for handling those issues badly. If you go back to the 1930s, you find many influential people saying the same kinds of things such people say nowadays: This isn’t really about the business cycle, never mind debates about macroeconomic policy; it’s about radical technological change and a work force that lacks the skills to deal with the new era. And then, thanks to World War II, we finally got the demand boost we needed, and all those supposedly unqualified workers — not to mention Rosie the Riveter — turned out to be quite useful in the modern economy, if given a chance. In turn, the driving force behind information and communications technology has been Moore's law, which can understood as the proposition that the number of components packed on to a computer chip would double every two years, implying a sharp fall in the capabilities of information technology. But the capability of making transistors ever-smaller, at least with current technology, is beginning to run into physical limits. IEEE Spectrum has published a "Special Report: 50 Years of Moore's Law," with a selection of a dozen short articles looking back at Moore's original formulation of the law, how it has developed over time, and prospects for the law continuing. Here are some highlights. Estimating the impact of robots on productivity and employment, by Guy Michaels and Georg Graetz, Vox EU: Robots' capacity for autonomous movement and their ability to perform an expanding set of tasks have captured writers' imaginations for almost a century. Recently robots have emerged from the pages of science fiction novels into the real world, and discussions of their possible economic effects have become ubiquitous (see e.g. The Economist 2014, Brynjolfsson and McAfee 2014). But a serious problem inhibits these discussions – there has so far been no systematic empirical analysis of the effects that robots are already having. In recent work we begin to remedy this problem (Graetz and Michaels 2015). We compile a new dataset spanning 14 industries (mainly manufacturing industries, but also agriculture and utilities) in 17 developed countries (including European countries, Australia, South Korea, and the US). Uniquely, our dataset includes a measure of the use of industrial robots employed in each industry, in each of these countries, and how it has changed from 1993-2007. We obtain information on other economic performance indicators from the EUKLEMS database (Timmer et al. 2007). Our findings on the aggregate impact of robots are interesting given recent concerns in the macroeconomic literature that productivity gains from technology in general may have slowed down. Gordon (2012, 2014) expresses a particularly pessimistic view, and there are broader worries about secular macroeconomic stagnation (Summers 2014, Krugman 2014), although others remain more optimistic (Brynjolfsson and McAfee 2014). We expect that the beneficial effects of robots will extend into the future as new robot capabilities are developed, and service robots come of age. Our findings do come with a note of caution: there is some evidence of diminishing marginal returns to robot use, or congestion effects, so robots are not a panacea for growth. Although we do not find evidence of a negative impact of robots on aggregate employment, we see a more nuanced picture when we break down employment (and the wage bill) by skill groups. Robots appear to reduce the hours and the wage bill shares of low-skilled workers, and to a lesser extent also of middle skilled workers. They have no significant effect on the employment of high-skilled workers. This pattern differs from the effect that recent work has found for ICT, which seems to benefit high-skilled workers at the expense of middle-skilled workers (Autor 2014, Michaels et al. 2014). In further results, we find that industrial robots increased total factor productivity and wages. At the same time, we find no significant effect of these robots on the labor share. In summary, we find that industrial robots made significant contributions to labor productivity and aggregate growth, and also increased wages and total factor productivity. While fears that robots destroy jobs at a large scale have not materialized, we find some evidence that robots reduced low- and middle-skilled workers’ employment. Mr. Autor’s latest paper, presented to a packed audience at this year’s meeting of central bankers at Jackson Hole, Wyo., emphasized how difficult it is to program machines to do many tasks that humans find often easy and intuitive. In it, he played off a paradox identified in the 1960s by philosopher Michael Polanyi, who noted that humans can do many things without being able to explain how, like identify the face of a person in a series of photographs as they age. Machines can’t do that, at least not with accuracy. To Mr. Autor, polarization of the job market is the real downside of automation. He calculates middle-skill occupations made up 60% of all jobs in 1979. By 2012, this fell to 46%. The same pattern is visible in 16 European Union economies he studied. Techno-neutrality: I’ve had a few posts in the past few months (here and here) about the consequences of mechanization for the future of work. In short, what will we do when the robots take our jobs? Stewart writes: "In 2010 and 2012, more workers feared losing their jobs, and far fewer workers said that it would be easy to find a comparable job, than in 1977 and 1978. ... Some may infer that the lower job security felt by Americans in 2010 and 2012 was an aberration, based upon the unusual conditions presented by the recent recession. But the reality is that the downward trend in feelings of job security has been going on for the last 35 years, apart from the “extra push” it has received from the “`Great Recession,' ..."
Is Uber really in a fight to the death? : In recent days, since their PR troubles, there has been much discussion as to why Uber seems to be so aggressive. Reasons ranged from being inept, to the challenges of fighting politics against taxi regulations to a claim that Uber’s market has a ‘winner take all’ nature. It is this last one that is of particular interest because it suggests that Uber has to fight hard against competitors like Lyft or it will lose. It also suggests that Uber’s $20 billion odd valuation is based on beliefs that it will win, and win big. There is a very strong correlation with race and income. Just 45 per cent of households with an income of less than $20,000 a year have broadband whereas the rate for those earning $75,000 or more is 91 per cent. About a third of African American and Hispanic households are unconnected compared to 20 per cent for white households and 10 per cent for Asian households. The rise of China and the future of US manufacturing, by Daron Acemoglu, David Autor, David Dorn, Gordon H. Hanson, and Brendan Price, Vox EU: The end of the Great Recession has rekindled optimism about the future of US manufacturing. In the second quarter of 2010 the number of US workers employed in manufacturing registered positive growth – its first increase since 2006 – and subsequently recorded ten consecutive quarters of job gains, the longest expansion since the 1970s. Advocating for the potential of an industrial turnaround, some economists give a positive spin to US manufacturing’s earlier troubles: while employment may have fallen in the 2000s, value added in the sector has been growing as fast as the overall US economy. Its share of US GDP has kept stable, an achievement matched by few other high-income economies over the same period (Lawrence and Edwards 2013, Moran and Oldenski 2014). The business press has giddily coined the term ‘reshoring’ to describe the phenomenon – as yet not well documented empirically – of companies returning jobs to the United States that they had previously offshored to low-wage destinations. Before we declare a renaissance for US manufacturing, it is worth re-examining the magnitude of the sector’s previous decline and considering the causal factors responsible for job loss. The scale of the employment decline is indeed stunning. Figure 1 shows that in 2000, 17.3 million US workers were employed in manufacturing, a level that with periodic ups and downs had changed only modestly since the early 1980s. By 2010, employment had dropped to 11.5 million workers, a 33% decrease from 2000. Strikingly, most of this decline came before the onset of the Great Recession. In the middle of 2007, on the eve of the Lehman Brothers collapse that paralysed global financial markets, US manufacturing employment had already dipped to 13.9 million workers, such that three-fifths of the job losses over the 2000 to 2010 period occurred prior to the US aggregate contraction. Figure 1 also reveals the paltriness of the recent manufacturing recovery. As of mid-2014, the number of manufacturing jobs had reached only 12.1 million, a level far below the already diminished pre-recession level. Source: US Bureau of Labor Statistics. We examine the reasons behind the recent decline in US manufacturing employment (Acemoglu et al. 2014). Our point of departure is the coincidence of the 2000s swoon in US manufacturing and a significant increase in import competition from China (Bernard et al. 2006). Between 1990 and 2011 the share of global manufacturing exports originating in China surged from two to 16% (Hanson 2012). This widely heralded export boom was the outcome of deep economic reforms that China enacted in the 1980s and 1990s, which were further extended by the country’s joining the World Trade Organization in 2001 (Brandt et al. 2012, Pierce and Schott 2013). China’s share in US manufacturing imports has expanded in concert with its global presence, rising from 5% in 1991 to 11% in 2001 before leaping to 23% in 2011. Could China’s rise be behind US manufacturing’s fall? The first step in our analysis is to estimate the direct impact of import competition from China on US manufacturing industries. Suppose that the economic opening in China allows the country to realise a comparative advantage in manufacturing that had lain dormant during the era of Maoist central planning, which entailed near prohibitive barriers to trade. As reform induces China to reallocate labour and capital from farms to factories and from inefficient state-owned enterprises to more efficient private businesses, output will expand in the sectors in which the country’s comparative advantage is strongest. China’s abundant labour supply and relatively scarce supply of arable land and natural resources make manufacturing the primary beneficiary of reform-induced industrial restructuring. The global implications of China’s reorientation toward manufacturing – strongly abetted by inflows of foreign direct investment – are immense. China accounts for three-quarters of all growth in manufacturing value added that has occurred in low and middle income economies since 1990. For many US manufacturing firms, intensifying import competition from China means a reduction in demand for the goods they produce and a corresponding contraction in the number of workers they employ. Looking across US manufacturing industries whose outputs compete with Chinese import goods, we estimate that had import penetration from China not grown after 1999, there would have been 560,000 fewer manufacturing jobs lost through 2011. Actual US manufacturing employment declined by 5.8 million workers from 1999 to 2011, making the counterfactual job loss from the direct effect of greater Chinese import penetration amount to 10% of the realised job decline in manufacturing. These direct effects of trade exposure do not capture the full impact of growing Chinese imports on US employment. Negative shocks to one industry are transmitted to other industries via economic linkages between sectors. One source of linkages is buyer-supplier relationships (Acemoglu et al. 2012). Rising import competition in apparel and furniture – two sectors in which China is strong – will cause these ‘downstream’ industries to reduce purchases from the ‘upstream’ sectors that supply them with fabric, lumber, and textile and woodworking machinery. Because buyers and suppliers often locate near one another, much of the impact of increased trade exposure in downstream industries is likely to transmit to suppliers in the same regional or national market. We use US input-output data to construct downstream trade shocks for both manufacturing and non-manufacturing industries. Estimates from this exercise indicate sizeable negative downstream effects. Applying the direct plus input-output measure of exposure increases our estimates of trade-induced job losses for 1999 to 2011 to 985,000 workers in manufacturing and to two million workers in the entire economy. Inter-industry linkages thus magnify the employment effects of trade shocks, almost doubling the size of the impact within manufacturing and producing an equally large employment effect outside of manufacturing. Two additional sources of linkages between sectors operate through changes in aggregate demand and the reallocation of labour. When manufacturing contracts, workers who have lost their jobs or suffered declines in their earnings subsequently reduce their spending on goods and services. The contraction in demand is multiplied throughout the economy via standard Keynesian mechanisms, depressing aggregate consumption and investment. Helping offset these negative aggregate demand effects, workers who exit manufacturing may take up jobs in the service sector or elsewhere in the economy, replacing some of the earnings lost in trade-exposed industries. Because aggregate demand and reallocation effects work in opposing directions, we can only detect their net impact on total employment. A further complication is that these impacts operate at the level of the aggregate economy – as opposed to direct and input-output effects of trade shocks which operate at the industry level – meaning we have only as many data points to detect their presence as we have years since the China trade shock commenced. Since China’s export surge did not hit with full force until the early 1990s, the available time series for the national US economy is disconcertingly short. To address this data challenge, we supplement our analysis of US industries with an analysis of US regional economies. We define regions to be ‘commuting zones’ which are aggregates of commercially linked counties that comprise well-defined local labour markets. Because commuting zones differ sharply in their patterns of industrial specialisation, they are differentially exposed to increased import competition from China (Autor et al. 2013). Asheville, North Carolina, is a furniture-making hub, putting it in the direct path of the China maelstrom. In contrast, Orlando, Florida (of Disney and Harry Potter World Fame), focuses on tourism, leaving it lightly affected by rising imports of manufactured goods. If the reallocation mechanism is operative, then when a local industry contracts as a result of Chinese competition, some other industry in the same commuting zone should expand. Aggregate demand effects should also operate within local labour markets, as shown by Mian and Sufi (2014) in the context of the recent US housing bust. If increased trade exposure lowers aggregate employment in a location, reduced earnings will decrease spending on non-traded local goods and services, magnifying the impact throughout the local economy. Our estimates of the net impact of aggregate demand and reallocation effects imply that import growth from China between 1999 and 2011 led to an employment reduction of 2.4 million workers. This figure is larger than the 2.0 million job loss estimate we obtain for national industries, which only captures direct and input-output effects. But it still likely understates the full consequences of the China shock on US employment. Neither our analysis for commuting zones nor for national industries fully incorporates all of the adjustment channels encompassed by the other. The national-industry estimates exclude reallocation and aggregate demand effects, whereas the commuting-zone estimates exclude the national component of these two effects, as well as the non-local component of input-output linkage effects. Because the commuting zone estimates suggest that aggregate forces magnify rather than offset the effects of import competition, we view our industry-level estimates of employment reduction as providing a conservative lower bound. What do our findings imply about the potential for a US manufacturing resurgence? The recent growth in manufacturing imports to the US is largely a consequence of China’s emergence on the global stage coupled with its deep comparative advantage in labour-intensive goods. The jobs in apparel, furniture, shoes, and other wage-sensitive products that the United States has lost to China are unlikely to return. Even as China’s labour costs rise, the factories that produce these goods are more likely to relocate to Bangladesh, Vietnam, or other countries rising in China’s wake than to reappear on US shores. Further, China’s impact on US manufacturing is far from complete. During the 2000s, the country rapidly expanded into the assembly of laptops and cell-phones, with production occurring increasingly under Chinese brands, such as Lenovo and Huawei. Despite this rather bleak panorama, there are sources of hope for manufacturing in the United States. Perhaps the most encouraging sign is that the response of many companies to increased trade pressure has been to increase investment in innovation (Bloom et al. 2011). The ensuing advance in technology may ultimately help create new markets for US producers. However, if the trend toward the automation of routine jobs in manufacturing continues (Autor and Dorn 2013), the application of these new technologies is likely to do much more to boost growth in value added than to expand employment on the factory floor. Acemoglu D, V Carvalho, A Ozdaglar, and A Tahbaz-Salehi (2012), “The Network Origins of Aggregate Fluctuations.” Econometrica, 80(5): 1977-2016. Acemoglu D, D H Autor, D Dorn, G H Hanson, and B Price (2014), “Import Competition and the Great US Employment Sag of the 2000s.” NBER Working Paper No. 20395. Autor, D H and D Dorn (2013), “The Growth of Low Skill Service Jobs and the Polarization of the US Labor Market.” American Economic Review, 103(5), 1553-1597. Autor D H, D Dorn, and G H Hanson (2013a) “The China Syndrome: Local Labor Market Effects of Import Competition in the United States.” American Economic Review, 103(6): 2121-2168. Bernard A B, J B Jensen, and P K Schott (2006), “Survival of the Best Fit: Exposure to Low-Wage Countries and the (Uneven) Growth of US Manufacturing Plants.” Journal of International Economics, 68(1), 219-237. Bloom N, M Draca, and J Van Reenen (2012), “Trade Induced Technical Change? The Impact of Chinese Imports on Innovation, IT, and Productivity.” Mimeo, Stanford University. Brandt L, J Van Biesebroeck, and Y Zhang (2012), “Creative Accounting or Creative Destruction? Firm-Level Productivity Growth in Chinese Manufacturing.” Journal of Development Economics, 97(2): 339-351. Hanson, G (2012), “The Rise of Middle Kingdoms: Emerging Economies in Global Trade.” Journal of Economic Perspectives, 26(2): 41-64. Mian, A and A Sufi (2014), “What Explains the 2007-2009 Drop in Employment?” Econometrica, forthcoming. Pierce, J R and P K Schott (2013), “The Surprisingly Swift Decline of US Manufacturing Employment.” Yale Department of Economics Working Paper, November. Will Automation Take Our Jobs? : Last fall economist Carl Benedikt Frey and information engineer Michael A. Osborne, both at the University of Oxford, published a study estimating the probability that 702 occupations would soon be computerized out of existence. Their findings were startling. Advances in ... technologies could, they argued, put 47 percent of American jobs at high risk of being automated in the years ahead. Loan officers, tax preparers, cashiers, locomotive engineers, paralegals, roofers, taxi drivers and even animal breeders are all in danger of going the way of the switchboard operator. The Next Wave of Technology?, by Tim Taylor: Many discussions of "technology" and how it will affect jobs and the economy have a tendency to discuss technology as if it is one-dimensional, which is of course an extreme oversimplification. Erik Brynjolfsson, Andrew McAfee, and Michael Spence offer some informed speculation on how they see the course of technology evolving in "New World Order: Labor, Capital, and Ideas in the Power Law Economy," which appears in the July/August 2014 issue of Foreign Affairs (available free, although you may need to register). 2) For low-income and middle-income countries like China..., their jobs and workforce would experience a dislocating wave of change. Automation Alone Isn’t Killing Jobs, by Tyler Cowen, Commentary, NY Times: Although the labor market report on Friday showed modest job growth, employment opportunities remain stubbornly low in the United States, giving new prominence to the old notion that automation throws people out of work. Back in the 19th century, steam power and machinery took away many traditional jobs, though they also created new ones. This time around, computers, smart software and robots are seen as the culprits. They seem to be replacing many of the remaining manufacturing jobs and encroaching on service-sector jobs, too. Driverless vehicles and drone aircraft are no longer science fiction, and over time, they may eliminate millions of transportation jobs. Many other examples of automatable jobs are discussed in “The Second Machine Age,” a book by Erik Brynjolfsson and Andrew McAfee, and in my own book, “Average Is Over.” The upshot is that machines are often filling in for our smarts, not just for our brawn — and this trend is likely to grow. See also, Dean Baker "If Technology Has Increased Unemployment Among the Less Educated, Someone Forgot to Tell the Data." This is a major problem for the Race Against the Machine hypothesis. Much of the growth in income share of the top 1 per cent occurred before 2000, when the stereotypical CEO was a technological illiterate who had his (sic) secretary print out his emails. Even today, the technology available to the typical senior manager—a PC with access to the Internet, and a corporate intranet with very limited capabilities—is no different to that of the average knowledge worker, and inferior to that of workers in tech-intensive specialties. Nor does the ownership of capital explain much here. Even for tech-intensive jobs, the capital and telecomm requirements for an individual worker cost no more than $10,000 for a top-of-the-line computer setup (amortized over 3-5 years), and perhaps $1000 a year for a broadband internet connection. This is well within the capacity of self-employed professional workers to pay for themselves, and in fact many professionals have better equipment at home than at work. Advances in information and communications technology thus can’t explain the vast majority of the growth in inequality over the past three decades. Will MOOCs lead to the democratisation of education?, by Joshua Gans: With all the recent discussion of how hard it is for journalists to read academic articles, I thought I’d provide a little service here and ‘translate’ the recent NBER working paper by Daron Acemoglu, David Laibson and John List, “Equalizing Superstars” for a general audience. The paper contains a ‘light’ general equilibrium model that may be difficult for some to parse. The authors argue that technological advances already in the works are likely to sustain Moore's law for another 5-10 years. This As I've written before, the power of doubling is difficult to appreciate at an intuitive level, but it means that the increase is as big as everything that came before. Intel is now etching transistors at 22 nanometers, and as the company points out, you could fit 6,000 of these transistors across the width of a human hair; or if you prefer, it would take 6 million of these 22 nanometer transistors to cover the period at the end of a sentence. Also, a 22 nanometer transistor can switch on and off 100 billion times in a second. The McKinsey analysts point out that while it is technologically possible for Moore's law to continue, the economic costs of further advances are becoming very high. They write: "A McKinsey analysis shows that moving from 32nm to 22nm nodes on 300-millimeter (mm) wafers causes typical fabrication costs to grow by roughly 40 percent. It also boosts the costs associated with process development by about 45 percent and with chip design by up to 50 percent. These dramatic increases will lead to process-development costs that exceed $1 billion for nodes below 20nm. In addition, the state-of-the art fabs needed to produce them will likely cost $10 billion or more. As a result, the number of companies capable of financing next-generation nodes and fabs will likely dwindle." Of course, it's also possible to have performance improvements and cost decreases on chips already in production: for example, the cutting edge of computer chips today will probably look like a steady old cheap workhorse of a chip in about five years. I suspect that we are still near the beginning, and certainly not yet at the middle, of finding ways for information and communications technology to alter our work and personal lives. 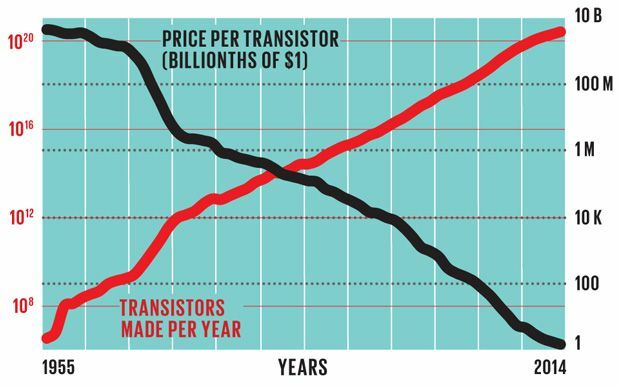 But the physical problems and higher costs of making silicon-based transistors at an ever-smaller scale won't be denied forever, either. So let me ask two questions about the proposed deal. First, why would we even think about letting it go through? Second, when and why did we stop worrying about monopoly power? And there are good reasons to believe ... that monopoly power has become a significant drag on the U.S. economy as a whole. There used to be a bipartisan consensus in favor of tough antitrust enforcement. During the Reagan years, however, antitrust policy went into eclipse, and ever since measures of monopoly power... have been rising fast. At first, arguments against policing monopoly power pointed to the alleged benefits of mergers in terms of economic efficiency. Later, it became common to assert that the world had changed in ways that made all those old-fashioned concerns about monopoly irrelevant. Aren’t we living in an era of global competition? Doesn’t ... creative destruction ... constantly tear down old industry giants and create new ones? The truth, however, is that many goods and especially services aren’t subject to international competition: New Jersey families can’t subscribe to Korean broadband. Meanwhile, creative destruction has been oversold: Microsoft may be ... in decline, but it’s still enormously profitable thanks to the monopoly position it established decades ago. Moreover, there’s good reason to believe that monopoly is itself a barrier to innovation...: why upgrade your network or provide better services when your customers have nowhere to go? And the same phenomenon may be ... holding back the economy as a whole. One puzzle ... has been the disconnect between profits and investment. Profits are at a record high..., yet corporations aren’t reinvesting their returns in their businesses. Instead, they’re buying back shares, or accumulating huge piles of cash. This is exactly what you’d expect to see if a lot of those record profits represent monopoly rents. It’s time, in other words, to go back to worrying about monopoly power, which we should have been doing all along. And the first step on the road back from our grand detour on this issue is obvious: Say no to Comcast. Enslave the robots and free the poor, by Martin Wolf, Commentary, FT: ...we must reconsider leisure. For a long time the wealthiest lived a life of leisure at the expense of the toiling masses. The rise of intelligent machines makes it possible for many more people to live such lives without exploiting others. Today’s triumphant puritanism finds such idleness abhorrent. Well, then, let people enjoy themselves busily. What else is the true goal of the vast increases in prosperity we have created? Job polarization and the decline of middle-class workers’ wages, by Michael Boehm, Vox EU: The decline of the middle class has come to the forefront of debate in the US and Europe in recent years. This decline has two important components in the labour market. First, the number of well-paid middle-skill jobs in manufacturing and clerical occupations has decreased substantially since the mid-1980s. Second, the relative earnings for workers around the median of the wage distribution dropped over the same period, leaving them with hardly any real wage gains in nearly 30 years. Pioneering research by Autor, Katz, and Kearney (2006), Goos and Manning (2007), and Goos, Manning, and Salomons (2009) found that the share of employment in occupations in the middle of the skill distribution has declined rapidly in the US and Europe. At the same time the share of employment at the upper and lower ends of the occupational skill distribution has increased substantially. Goos and Manning termed this phenomenon “job polarization” and it is depicted for US workers in Figure 1. Notes: The chart depicts the percentage point change in employment in the low-, middle- and high-skilled occupations in the National Longitudinal Survey of Youth (NLSY) and the comparable years and age group in the more standard Current Population Survey (CPS). The high-skill occupations comprise managerial, professional services and technical occupations. The middle-skill occupations comprise sales, office/administrative, production, and operator and laborer occupations. The low-skill occupations include protective, food, cleaning and personal service occupations. In an influential paper, Autor, Levy, and Murnane (2003) provide a compelling explanation: they found that middle-skilled manufacturing and clerical occupations are characterized by a high intensity of procedural, rule-based activities which they call “routine tasks”. As it happens, these routine tasks can relatively easily be coded into computer programs. Therefore, the rapid improvements in computer technology over the last few decades have provided employers with ever cheaper machines that can replace humans in many middle-skilled activities such as bookkeeping, clerical work and repetitive production tasks. These improvements in technology also enable employers to offshore some of the routine tasks that cannot be directly replaced by machines (Autor 2010). Moreover, cheaper routine tasks provided by machines complement the non-routine abstract tasks that are intensively carried out in high-skill occupations. For example, data processing computer programs strongly increased the productivity of highly-skilled professionals. Machines also do not seem to substitute for the non-routine manual tasks that are intensively carried out in low-skill occupations. For example, computers and robots are still much less capable of driving taxis and cleaning offices than humans. Thus, the relative economy-wide demand for middle-skill routine occupations has declined substantially. This routinization hypothesis, due to Autor, Levy, and Murnance, has been tested in many different settings and it is widely accepted as the main driving force of job polarization. Around the same time as job polarization gathered steam in the US, the distribution of wages started polarizing as well. That is, real wages for middle-class workers stagnated while earnings of the lowest and the highest percentiles of the wage distribution increased. This is depicted in Figure 2. Notes: The chart depicts the change in log real wages along the quantiles of the wage distribution between the two cohorts for the NLSY and the comparable years and age group in the CPS. It thus seems natural to think that the polarization of wages is just another consequence of the declining demand for routine tasks. However, there exists some evidence that is not entirely consistent with this thought: virtually all European countries experienced job polarization as well, yet most of them haven’t seen wage polarization but rather a continued increase in inequality across the board. Moreover, other factors that may have generated wage polarization in the US have been proposed (e.g. an increase in the minimum wage, de-unionization, and ‘classical’ skill-biased technical change). First, have the relative wages of workers in middle-skill occupations declined as should be expected by the routinization hypothesis? Second, have the relative wage rates paid per ‘constant unit of skill’ in the middle-skill occupations dropped with polarization? Third, can job polarization explain the changes in the overall wage distribution? I answer these questions by analyzing two waves of a representative survey of teenagers in the US carried out in 1979 and 1997. The survey responses provide detailed and multidimensional characteristics of these young people that influence their occupational choices and wages when they are 27 years old in the end of the 1980s and the end of the 2000s. Using these characteristics, I compute the probabilities of workers in the 1980s and today choosing middle-skill occupations and then compare the wages associated with these probabilities over time. My empirical strategy relies on predicting the occupations that today’s workers would have chosen had they lived in the 1980s and then comparing their wages to those of workers who actually chose these occupations at that time. The results from this approach show a substantial negative effect of job polarization on middle-skill workers. The positive wage effect associated with a 1% higher probability of working in high-skill jobs (compared to middle-skill jobs) almost doubled between the 1980s and today. The negative wage effect associated with a 1% higher probability of working in low-skill services jobs compared with middle-skill jobs attenuated by over a third over the same period. I find similar results when controlling for college education, which is arguably a measure of absolute skill. This suggests that it is indeed the relative advantage in the middle-skill occupations for which the returns in the labor market have declined. In the next step of my analysis, I estimate the changes in relative market wage rates that are offered for a constant unit of skill in each of the three occupational groups. Again, the position of the middle-skill occupations deteriorates substantially: the wage rates paid in the high-skill occupations increased by 20% compared to the middle while the wage rate in the low-skill occupations rose by 30%. This decline in the relative attractiveness of working in middle-skill occupations is consistent with the massive outflow of workers from these jobs. Finally, I check what effect the changing prices of labour may have had on the overall wage distribution and whether they can explain the wage polarization that we observe in the US. Figure 3 shows that the change in the wage distribution due to these price effects reproduces the overall distribution reasonably well in the upper half while it fails to match the increase of wages for the lowest earners compared to middle earners. Notes: The chart plots the actual and counterfactual changes in the wage distribution in the NLSY when workers in 1980s are assigned the estimated price changes in their occupations. At first glance, this is surprising given the strong increase in relative wage rates for low-skill work and the increase in the wages of workers in low-skill occupations. The reason is that these workers now move up in the wage distribution, which lifts not only the (low) quantiles where they started out but also the (middle) quantiles where they end up. The inverse happens for workers in middle-skill occupations but with the same effect on the wage distribution. Despite the above findings, my paper does not provide the last word about the effect of job polarisation on the bottom of the wage distribution. This is because, for example, my estimates do not take into account potential additional wage effects from workers moving out of the middle-skill occupations into low-skill occupations. Therefore, we cannot yet finally assess the role that job polarisation versus policy factors (such as the raise of the minimum wage) played on the lower part of the wage distribution in the US. However, what emerges unambiguously from my work is that routinization has not only replaced middle-skill workers’ jobs but also strongly decreased their relative wages. Policymakers who intend to counteract these developments may want to consider the supply side: if there are investments in education and training that help low and middle earners to catch up with high earners in terms of skills, this will also slow down or even reverse the increasing divergence of wages between those groups. In my view, the rising number of programs that try to tackle early inequalities in skill formation are therefore well-motivated from a routinization-perspective. Acemoglu, D and D H Autor (2011), “Skills, Tasks and Technologies: Implications for Employment and Earnings”, in Handbook of Labor Economics edited by Orley Ashenfelter and David Card, Vol. 4B, Ch. 12, 1043-1171. Autor, D H (2010), "The polarization of job opportunities in the US labour market: Implications for employment and earnings", Center for American Progress and The Hamilton Project. Autor, D H and D. Dorn (2013), “The Growth of Low-Skill Service Jobs and the Polarization of the US Labor Market”, The American Economic Review, 103(5), 1553–97. Autor D H, L F Katz, and M S Kearney (2006), "The Polarization of the US Labor Market", The American Economic Review 96.2, 189-194. Autor D H, F Levy and R Murnane (2003), ‘The Skill Content of Recent Technological Change: An Empirical Exploration’, Quarterly Journal of Economics 118(4): 1279-1333. Boehm, M J (2013), “The Wage Effects of Job Polarization: Evidence from the Allocation of Talents”, Working Paper. Goos, M and A Manning (2007), "Lousy and lovely jobs: The rising polarization of work in Britain", The Review of Economics and Statistics 89.1, 118-133. Michaels G, A Natraj, and J Van Reenen (2013), “Has ICT Polarized Skill Demand? Evidence from Eleven Countries over 25 Years”, forthcoming in Review of Economics and Statistics; earlier version available as CEP Discussion Paper No. 987 (http://cep.lse.ac.uk/pubs/download/dp0987.pdf). Spitz-Oener, A (2006), "Technical change, job tasks, and rising educational demands: Looking outside the wage structure", Journal of Labor Economics 24.2, 235-270. 1 This figure and the ones below are based on two representative samples for 27 year old males in the United States (the National Longitudinal Survey of Youth (NLSY) and the Current Population Survey (CPS)). For qualitatively similar statistics on all prime age workers, refer to Acemoglu & Autor (2011). 2 Examples of tests of the routinization hypothesis include Michaels et al (2013) who find that industries with faster growth of information and communication technology had greater decreases in the relative demand for middle educated workers; Spitz-Oener (2006) who shows that job tasks have become more complex in occupations that rapidly computerized; and Autor and Dorn (2013) who show that local labour markets that specialised in routine tasks adopted information technology faster and experienced stronger job polarisation. 3 For the details of this estimation, please refer to the paper. The Robots Are Here and More Are Coming: Do Not Blame Them for our Wage or Job Problems, , by Lawrence Mishel: The “robots are coming” narrative dominating discussions of the economy was popularized by Erik Brynjolfsson and Andrew McAfee in their 2011 book, Race Against the Machine. They have built on that theme in the richer, deeper The Second Machine Age (W.W. Norton, 2014). The first half of the book provides a valuable window, at least for a non-technologist like me, into past developments and the future trajectory of digitization. Their claim is that digitization will do for mental power what the steam engine did for muscle power—that is, quite a bit, transforming our lives at work and play. On wage inequality, the authors offer “skill-biased technical change” or SBTC as the explanation. In fact, they offer two distinct SBTC narratives, both of which cannot be simultaneously true and neither of which aptly explains wage trends. So, again, these two SBTC narratives can’t both be true—either middle-wage workers are doing better than low-wage workers or they’re not. And neither one can explain the trends of the 2000s, the period where one would expect digitization’s impact to be most evident. The robots are here and more will be coming but they are not responsible for our employment or our wage problems. Read the first half of the book to learn about technology but take the second half with a grain of salt. For understanding wage inequality you should look elsewhere. Robots and Economic Luddites: They Aren't Taking Our Jobs Quickly Enough: Lydia DePillis warns us in the Post of 8 ways that robots will take our jobs. It is amazing how the media have managed to hype the fear of robots taking our jobs at the same time that they have built up fears over huge budget deficits bankrupting the country. You don't see the connection? Maybe you should be an economics reporter for a leading national news outlet. Okay, let's get to basics. The robots taking our jobs story is a story of labor surplus, too many workers, too few jobs. Everything that needs to be done is being done by the robots. There is nothing for the rest of us to do but watch. There can of course be issues of distribution. If the one percent are able to write laws that allow them to claim everything the robots produce then they can make most of us very poor. But this is still a story of society of plenty. We can have all the food, shelter, health care, clean energy, etc. that we need; the robots can do it for us. Okay, now let's flip over to the budget crisis that has the folks at the Washington Post losing sleep. This is a story of scarcity. We are spending so much money on our parents' and grandparents' Social Security and Medicare that there is no money left to educate our kids. Some confused souls may say that the problem may not be an economic one, but rather a fiscal problem. The government can't raise the tax revenue to pay for both the Social Security and Medicare for the elderly and the education of our kids. This is confused because if we are living in the world where the robots are doing all the work then the government really doesn't need to raise tax revenue, it can just print the money it needs to back its payments. Okay, now everyone is completely appalled. The government is just going to print trillions of dollars? That will send inflation through the roof, right? Not in the world where robots are doing all the work it won't. If we print money it will create more demands for goods and services, which the robots will be happy to supply. As every intro econ graduate knows, inflation is a story of too much money chasing too few goods and services. But in the robots do everything story, the goods and services are quickly generated to meet the demand. Where's the inflation, robots demanding higher wages? In short, you can craft a story where we have huge advances in robot technology so that the need for human labor is drastically reduced. You can also craft a story where an aging population leads to too few workers being left to support too many retirees. However, you can't believe both at the same time unless you write on economic issues for the Washington Post. On the other hand, the scarcity mongers don't have much of a case either. Even if productivity growth stays at just a 1.5 percent annual rate its impact on raising wages and living standards will swamp any conceivable tax increases associated with caring for a larger population of retirees. 1. Technological and skill deficiency explanations of wage inequality have failed to explain key wage patterns over the last three decades, including the 2000s. The early version of the “skill-biased technological change” (SBTC) explanation of wage inequality posited a race between technology and education where education levels failed to keep up with technology-driven increases in skill requirements, resulting in relatively higher wages for more educated groups, which in turn fueled wage inequality (Katz and Murphy 1992; Autor, Katz, and Krueger 1998; and Goldin and Katz 2010). However, the scholars associated with this early, and still widely discussed, explanation highlight that it has failed to explain wage trends in the 1990s and 2000s, particularly the stability of the 50/10 wage gap (the wage gap between low- and middle-wage earners) and the deceleration of the growth of the college wage premium since the early 1990s (Autor, Katz, and Kearney 2006; Acemoglu and Autor 2012). This motivated a new technology-based explanation (formally called the “tasks framework”) focused on computerization’s impact on occupational employment trends and the resulting “job polarization”: the claim that occupational employment grew relatively strongly at the top and bottom of the wage scale but eroded in the middle (Autor, Levy, and Murnane 2003; Autor, Katz, and Kearney 2006; Acemoglu and Autor 2012; Autor 2010). We demonstrate that this newer version—the task framework, or job polarization analysis—fails to explain the key wage patterns in the 1990s it intended to explain, and provides no insights into wage patterns in the 2000s. We conclude that there is no currently available technology-based story that can adequately explain the wage trends of the last three decades. 2. History shows that middle-wage occupations have shrunk and higher-wage occupations have expanded since the 1950s. This has not driven any changed pattern of wage trends. We demonstrate that key aspects of “job polarization” have been taking place since at least 1950. We label this “occupational upgrading” since it primarily consists of shrinkage in relative employment in middle-wage occupations and a corresponding expansion of employment in higher-wage occupations. Lower-wage occupations have remained a small (less than 15 percent) and relatively stable share of total employment since the 1950s, though they have grown in importance in the 2000s. Occupational upgrading has occurred in decades with both rising and falling wage inequality and in decades with both rising and falling median wages, indicating that occupational employment patterns, by themselves, cannot explain the salient wage trends. 3. Evidence for job polarization is weak. We use the Current Population Survey to replicate existing findings on job polarization, which are all based on decennial census data. Job polarization is said to exist when there is a U-shaped plot in changes in occupational employment against the initial occupational wage level, indicating employment expansion among high- and low-wage occupations relative to middle-wage occupations. As shown in Figure E (explained later in the paper but introduced here), in important cases, these plots do not take the posited U-shape. More importantly, in all cases the lines traced out fit the data very poorly, obscuring large variations in employment growth across occupational wage levels. 4. There was no occupational job polarization in the 2000s. In the 2000s, relative employment expanded in lower-wage occupations, but was flat at both the middle and the top of the occupational wage distribution. The lack of overall job polarization in the 2000s is a phenomenon visible in both the analyses of decennial census/American Community Survey data provided by proponents of the tasks framework/job polarization perspective (Autor 2010; Acemoglu and Autor 2012) and in our analysis of the Current Population Survey. Thus, the standard techniques applied to the data for the 2000s do not establish even a prima facie case for the existence of overall job polarization in the most recent decade. This leaves the job polarization story, at best, as an account of wage inequality in the 1990s. It certainly calls into question whether it should be a description of current labor market trends and the basis of current policy decisions. 5. Occupational employment trends do not drive wage patterns or wage inequality. We demonstrate that the evidence does not support the key causal links between technology-driven changes in tasks and occupational employment patterns and wage inequality that are at the core of the tasks framework and job polarization story. Proponents of job polarization as a determinant of wage polarization have, for the most part, only provided circumstantial evidence: both trends occurred at the same time. The causal story of the tasks framework is that technology (i.e., computerization) drives changes in the demand for tasks (increasing demand at the top and bottom relative to the middle), producing corresponding changes in occupational employment (increasing relative employment in high- and low-wage occupations relative to middle-wage occupations). These changes in occupational employment patterns are said to drive changes in overall wage patterns, raising wages at the top and bottom relative to the middle. However, the intermediate step in this story must be that occupational employment trends change the occupational wage structure, raising relative wages for occupations with expanding employment shares and vice-versa. We demonstrate that there is little or no connection between decadal changes in occupational employment shares and occupational wage growth, and little or no connection between decadal changes in occupational wages and overall wages. Changes within occupations greatly dominate changes across occupations so that the much-focused-on occupational trends, by themselves, provide few insights. 6. Occupations have become less, not more, important determinants of wage patterns. The tasks framework suggests that differences in returns to occupations are an increasingly important determinant of wage dispersion. Using the CPS, we do not find this to be the case. We find that a large and increasing share of the rise in wage inequality in recent decades (as measured by the increase in the variance of wages) occurred within detailed occupations. Furthermore, using DiNardo, Fortin, and Lemieux’s reweighting procedure, we do not find that occupations consistently explain a rising share of the change in upper tail and lower tail inequality for either men or women. 7. An expanded demand for low-wage service occupations is not a key driver of wage trends. We are skeptical of the recent efforts of Autor and Dorn (2013) that ask the low-wage “service occupations” to carry much or all of the weight of the tasks framework. First, the small size and the slow, relatively steady growth of the service occupations suggest significant limitations of a technology-driven expansion of service occupations to be able to explain the large and contradictory changes in wage growth at the bottom of the distribution (i.e., between middle and low wages, the 50/10 wage differential), let alone movements at the middle or higher up the wage distribution. The service occupations remain a relatively small share of total employment; in 2007, they accounted for less than 13 percent of total employment, and just over half of employment in the bottom quintile of occupations ranked by wages. Moreover, these occupations have expanded only modestly in recent decades, increasing their employment share by 2.1 percentage points between 1979 and 2007, with most of the gain in the 2000s. Relative employment in all low-wage occupations, taken together, has been stable for the last three decades, representing a 21.1 percent share of total employment in 1979, 19.7 percent in 1999, and 20.0 percent in 2007. Second, the expansion of service occupation employment has not driven their wage levels and therefore has not driven overall wage patterns. The timing of the most important changes in employment shares and wage levels in the service occupations is not compatible with conventional interpretations of the tasks framework. Essentially all of the wage growth in the service occupations over the last few decades occurred in the second half of the 1990s, when the employment share in these occupations was flat. The observed wage increases preceded almost all of the total growth in service occupations over the 1979–2007 period, which took place in the 2000s, when service occupation wages were falling (another trend that contradicts the overall claim of the explanatory power of service occupation employment trends). 8. Occupational employment trends provide only limited insights into the main dynamics of the labor market, particularly wage trends. A more general point can and should be drawn from our findings: Occupational employment trends do not, by themselves, provide much of a read into key labor market trends because changes within occupations are dominant. Recent research and journalistic treatment of the labor market has highlighted the pattern of occupational employment growth to assess the extent of structural unemployment, the disproportionate increase in low-wage jobs, and the “coming of robots”—changes in workplace technology and the consequent impact on wage inequality. The recent academic literature on wage inequality has highlighted the role of changes in the occupational distribution of employment as the key factor. In particular, occupational employment trends have become increasingly used as indicators of job skill requirement changes, reflecting the outcome of changes in the nature of jobs and the way we produce goods and services. Our findings indicate, however, that occupational employment trends give only limited insight and leave little imprint on the evolution of the occupational wage structure, and certainly do not drive changes in the overall wage structure. We therefore urge extreme caution in drawing strong conclusions about overall labor market trends based on occupational employment trends by themselves. I suppose I should note that I haven't read this closely enough yet to endorse every word (or not). Full paper here (scroll down). Farmers, they thought, produced the net value in the economy--the net product. Their labor combined with water, soil, and sun grew the food they and others ate. Artisans, the physiocrats thought, were best seen not as creators but as transformers of wealth--transformers of wealth in the form of food into wealth in the form of manufactures. Aristocrats collected this net product--agricultural production in excess of farmers' subsistence needs--and spent it buying manufactured goods and, when they got sated with manufactured goods, employing flunkies. the fraction f who are farmers. the net product per farmer n.
the fraction who can be set to work making manufactured goods that aristocrats can consume before becoming sated m.
This gives the standard of living of the typical flunky--say, a runner for His Grace the Cardinal. The numerator is the amount of resources on which flunkies can subsist. The denominator is the number of flunkies. If this quantity W is low, the country is poor: flunkies are ill-paid, begging and thievery are rampant, and the reserve army of potential unemployed puts downward pressure on artisan and farmer living standards as well. If this quantity is high, the country is prosperous. Scientific farming to boost n and so boost the net product nf. A reallocation of the tax burden to make it less onerous to be a farmer--and so boost the farmer share f and so boost the net product nf. With the unquestioned assumption that there were limits on how high the net product per farmer n could be pushed, the physiocrats would have forecast that France of today, with only 5% of the population farmers, would be a hellhole: huge numbers of ill-paid flunkies sucking up to the aristocratic landlords. Well, the physiocrats were wrong about the decline of the agricultural share of the labor force. And let us hope that the techno-pessimists are similarly wrong about the rise of the robots. The ICT Revolution Isn’t Over: ...I thought I would make one casual observation about technology. Here it is:... the relatively limited impact so far of the much-heralded rise of ICT — information and communication technologies. For a long time these technologies seemed to be doing nothing for the economy; then, finally, they seemed to kick in circa 1995. But the new era of productivity growth, as Bob says, wasn’t a match for the long boom post World War II, and seemed to have petered out by the late 2000s. What I’d note, however, is that there is almost surely a second wind coming. The 1995-2007 productivity rise was basically a “wired” phenomenon, a lot of it having to do with local area networks rather than the Internet. Wireless data is a whole different thing, and it’s a surprisingly recent thing — the iPhone was introduced in 2007, the iPad in 2010. And we know from repeated experience that it takes quite a while for new technologies to show up in economic growth, a point famously made by Paul David and confirmed by the 25-year lag between the introduction of the microprocessor and the 90s productivity takeoff. So there’s more coming. How big is another question. R&D spending is often cited as an important source of productivity growth within a firm, especially in terms of product innovation. But R&D is also an inherently risky endeavor, since the outcome is quite uncertain. So to the extent that economic and policy uncertainty has helped make businesses more cautious in recent years, a slow pace of R&D spending is not surprising. On top of that, the federal funding of R&D activity remains under significant budget pressure. See, for example, here. So you can add R&D spending to the list of things that seem to be moving more slowly than normal. Or should we think of it as normal? Robert J Gordon and Tyler Cowen, inter alia, have expressed the view that technological progress is slowing down (Gordon 2012, Cowen 2011). Jan Vijg has suggested that the industrialised West of the 21st century will resemble the declining Empires of late Rome and Qing China (Vijg 2011). Their basic point is that technological dynamism is fizzling out. The low-hanging fruits that have improved our lives so much in the 20th century have all been picked. We should be ready for a more stagnant world in which living standards rise little if at all. History is always a bad guide to the future and economic historians should avoid making predictions. All the same, the historical records provide some insights into what makes societies technologically creative. Such insights, in turn can be used at the basis for looking ahead to assess how likely such a decline is to take place. The answer is short and simple: we ain’t seen nothin’ yet, the best is still to come. My argument concerns both the supply and the demand sides of innovation. Starting with supply, what is it that accounts for sustained technological progress? The relation between scientific progress and technology is a complex two-way street. For example, 19th-century energy-physics learned more from the steam engine than the other way around. The historical record makes clear that science depends on technology in that it depends on the instruments and tools that are needed for science to advance. New instruments opened new horizons in what Derek Price called "artificial revelation”, observations through instruments that allow us to see things that would otherwise be invisible. The Scientific Revolution of the 17th century depended critically on the development of the telescope, the microscope, the barometer, the vacuum pump, and similar contraptions. The achromatic-lens microscope developed by Joseph J Lister (father of the famous surgeon) in the 1820s paved the way for the germ theory, the greatest breakthrough in medicine before 1900. The equipment designed by Heinrich Hertz allowed him to detect electromagnetic radiation in the 1880s and Robert Millikan’s ingenious oil-drop apparatus allowed him to measure the electric charge of an electron (1911). X-ray crystallography, developed in 1912, was crucial forty years later in the discovery of the structure of DNA. DNA sequencing machines and cell analysis through flow cytometry (to mention but two) have revolutionised molecular microbiology. High-powered computers are helping research in every domain conceivable, from content analysis in novels to the (very hard) problems of turbulence. Astronomy, nanochemistry, and genetic engineering are all areas in which progress has been mind-boggling in the past few decades thanks to better tools. To be sure, there is no automatic mechanism that turns better science into improved technology. But there is one reason to believe that in the near future it will do so better and more efficiently than ever before. The reason is access. Inventors, engineers, applied chemists, and physicians all need access to best-practice science to answer an infinite list of questions about what can and cannot be done. Search engines were invented in the 18th century through encyclopaedias and compendia that arranged all available knowledge in alphabetical order, making it easy to find. Textbooks had indexes that did the same. Libraries developed cataloguing systems and other techniques that made scientific information findable. But these search systems have their limitations. One might have feared that the explosion of scientific knowledge in the 20th century could outrun our ability to find what we are looking for. Yet the reverse has happened. The development of searchable databanks of massive sizes has even outrun our ability to generate scientific knowledge. Copying, storing, transmitting, and searching vast amounts of information today is fast, easy, and practically free. We no longer deal with megabytes or gigabytes. Instead terms like petabytes (a million gigabytes) and zettabytes (a million petabytes) are being bandied about. Scientists can now find the tiniest needles in data haystacks as large as Montana in a fraction of a second. And if science sometimes still proceeds by ‘trying every bottle on the shelf’ – as in some areas it still does – it can search with blinding speed over many more bottles, perhaps even peta-bottles. Have all the low-hanging fruits been picked? One answer is that the analogy is flawed. Science builds taller and taller ladders, so we can reach the upper branches, and then the branches above them. A less obvious answer is that technological progress is fundamentally a dis-equilibrating process. Whenever a technological solution is found for some human need, it creates a new problem. As Edward Tenner put it, technology ‘bites back’. The new technique then needs a further ‘technological fix’, but that one in turn creates another problem, and so on. The notion that invention definitely ‘solves’ a human need, allowing us to move to pick the next piece of fruit on the tree is simply misleading. Each solution perturbs some other component in the system and sows the seed of more needs; the ‘demand’ for new technology is thus self-sustaining. The most obvious example for such a dynamic is in our never-ending struggles with insects and harmful bacteria. In those wars, evolutionary mechanisms decree that after most battles we win, the enemy regroups by becoming resistant to whatever poison we throw at them. Drug-resistant bacteria are increasingly common and require novel approaches to new antibiotics. The search for novel antibiotics will resume with tools that Chain and Florey would never have dreamed of – but even such new antibiotics will eventually lead to adaptation. In agriculture, the advance in fertiliser use has helped avert the Malthusian disasters that various doom-and-gloom authors predicted. But the vast increase in nitrate use following Fritz Haber’s epochal invention of the nitrogen-fixing process before World War I has now led to serious environmental problems in aquifer pollution and algae blooms. Again, technology will provide us with a fix, possibly through genetic engineering in which more plants can fix their own nitrates rather than needing fertiliser or bacteria that convert nitrates into nitrogen at more efficient rates. Another example is energy: For better or for worse, modern technology has relied heavily on fossil fuels: first coal, then oil, and now increasingly on natural gas. The bite-back here has been planetary in scope: climate change is no longer a prospect, it is a reality. Can new technology stop it? There is no doubt that it can, even if nobody can predict right now what shape that will take, and if collective action difficulties will actually make it realistic. What will the workers do? Perhaps the biggest bite-back is what happens to human labour. If technology replaces workers, what will the role of people become? From Kurt Vonnegut to Erik Brynjolfsson, dystopias about an idle and vapid humanity in a robotised economy have worried people. There will be disruption and pain, but the new technology will also create new demand for workers, to perform tasks that a new technology creates. In 1914 who could have imagined occupations such as video game programmer or identity-theft security guard? Physical therapists, social media consultants, and TV sports commentators are all occupations created by new technology. It seems plausible that the future, too, will create occupations we cannot imagine, let alone envisage. Furthermore, the task that 20th-century technology seems to have carried out the easiest is to create activities that fill the ever-growing leisure time that early retirement and shorter work-weeks have created. Technological creativity has responded to the growth of free time: a bewildering choice of programmes on TV, the rise of mass tourism, access at will to virtually every film made and opera written, and a vast pet industry are just some examples. The cockfights and eye-gouging contests with which working classes in the past entertained themselves have been replaced by a gigantic high-tech spectator-sports industrial complex, both local and global. In his brief Economic Possibilities for our Grandchildren (1931) Keynes foresaw much of the future impact of technology. His insights may surprise those who regard him as the prophet of unemployment: “all this [technological change] means in the long run [is] that mankind is solving its economic problem” (italics in original). Contemplating a world in which work itself would become redundant thanks to science and capital (Keynes did not envisage robots, but they would have strengthened his case), he felt that this age of leisure and abundance was frightening people because “we have been trained too long to strive and not to enjoy”. Brynjolfsson, Erik and Andrew McAfee (2011), Race Against the Machine, New York, Digital Frontier Press. Cowen, Tyler (2011), The Great Stagnation, New York, Dutton. Gordon Robert J (2012), “Is US Economic Growth over? Faltering Innovation confronts the six Headwinds”, NBER Working paper series, 18315, August. Mokyr, Joel (2002), The Gifts of Athena, Princeton, Princeton University Press. Price, Derek J de Solla (1984a), “Notes towards a Philosophy of the Science/Technology Interaction” in Rachel Laudan (ed.) The Nature of Knowledge: are Models of Scientific Change Relevant?, Dordrecht, Kluwer. Tenner, Edward (1996), Why Things Bite Back: Technology and the Revenge of Unintended Consequences, New York, Knopf. Vijg, Jan (2011), The American Technological Challenge: Stagnation and Decline in the 21st Century, New York, Algora Publishing. Vonnegut, Kurt (1974), Player Piano, New York, Dell Paperbacks. How Technology Wrecks the Middle Class, by David Autor and David Dorn, Commentary, NY Times: In the four years since the Great Recession officially ended, the productivity of American workers — those lucky enough to have jobs — has risen smartly. But the United States still has two million fewer jobs than before the downturn, the unemployment rate is stuck at levels not seen since the early 1990s and the proportion of adults who are working is four percentage points off its peak in 2000.